Pictured is a rendering of the OhioHealth medical facility proposed for the west side of Delaware. The entrance to the facility would be located off of Lansdale Drive. The back of the facility would face West William Street. 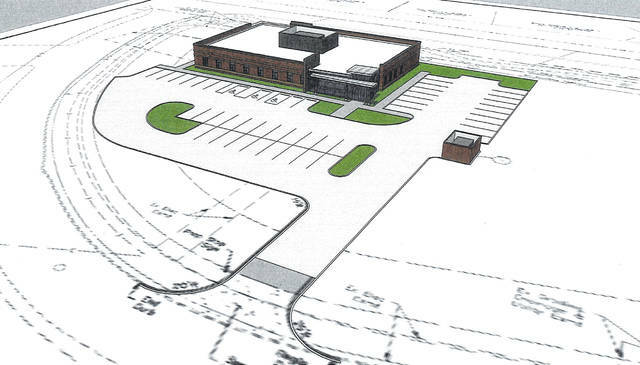 Pending final approval from Delaware City Council, OhioHealth is set to construct an office building on the city’s west side at 2295 W. William St., just west of South Houk Road. During Monday’s (Jan. 28) council meeting, the final development plan for the facility underwent a first reading with council members expected to vote on the proposal at their next meeting. Proposed is a 10,000-square-foot, one-story building with 50 parking spaces that will sit on a 3.31-acre parcel at the corner of Marysville Road (West William Street/U.S. Route 36) and Lansdale Drive. The building will take up approximately half of the parcel, but the entire parcel is owned by OhioHealth. The company noted there is the possibility in the future that the proposed building could be expanded or a second building could be constructed on the parcel. Access to the building will come from Lansdale Drive. During Delaware Planning Commission’s review of the final development plan earlier this month, Commissioner Jim Halter asked about the possibility of traffic lights being reinstalled at the intersection of Lansdale Drive and Marysville Road. There are currently mast arms at the intersection where traffic lights once operated, but the lights were removed after being deemed unwarranted. Carrie Forman, a project engineer for the city, said trip generations (a transportation forecasting tool) were requested from the developers, and the intersection will be re-evaluated to determine whether the signals would be warranted. McKay added the building may also rotate specialists through the facility to further accommodate Delaware residents. Asked if the addition of the building would take physicians away from other OhioHealth facilities around Delaware, McKay said one or two may be relocated to the new facility, but otherwise new staff would be hired. The next city council meeting is scheduled for 7 p.m. on Monday, Feb. 11. Meetings are held in the city council chambers at City Hall, located at 1 S. Sandusky St.